What if you were promised a free coffee at your favorite coffee shop after every 10 purchases? Would you sign up? Absolutely! Odds are, you probably would have bought it anyway, but now instead of trying the new shop up the street, you continue to go back to your favorite one because you want to earn that free cup of coffee! This is exactly the type of behavior you’ll see with your customers if you offer a loyalty program at your small business. But maybe you’re asking yourself, “Why would I want to give something away for free?” The answer is because you’ll make up the cost of that item with the additional purchases a customer makes while frequenting your store, as they cash in on the rewards or loyalty program you offer. In case you’re still leery of the idea or potential upfront costs, here’s some hard evidence that backs up the benefits a loyalty program can have for your business. While you may have customers coming in from all over, what percentage are repeat customers? Surprisingly, though your repeat customers may be a smaller percentage, they make up a large majority of your total sales. 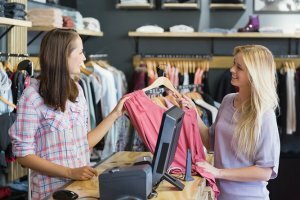 A study done at Northwestern University found that “only 12%-15% of customers are loyal to a single retailer…but that small cadre of shoppers generate between 55%-70% of company sales.” By adding a loyalty program into the mix, you’ll strengthen that loyalty to your business while simultaneously increasing sales. One of the hardest parts of any business is getting enough people to like what you’re selling or offering. Once you gain customers, it’s crucial to retain them. If you give your customers an extra reason to return, such as rewards from a loyalty program, it’s more likely that they will. Maybe each dollar spent in-store is a point that can be saved for future purchases. Or after so many purchases, they get 20% off for a single item. Loyalty programs help entice customers to stick around. It encourages repeat purchases. A Harvard study stated, “Companies can boost profits by almost 100% by retaining just 5% more of their customers.” With numbers like that, you should be doing everything in your power to retain your already existing customers. Imagine if you were able to increase that average 12%-15% loyalty to 20%! The more reason your customers have to return, the better off your business is. This may seem counter intuitive since a loyalty program means an expense for your business, but getting these customers to keep coming back and make more purchases is actually far cheaper than acquiring new ones. If it means offering some type of loyalty program or discount card, then by all means, do it! It is 7 times less expensive to keep a customer than to acquire a new one. So even if you spend a small amount on implementing an effective loyalty program, you will still come out on top because of how much cheaper it is to retain a customer than find new ones. Have you ever wondered what your customers want more of? What they like and don’t like? What you should stock more or less of? The great thing about having a loyalty program in place at your business is that you can get access to this data now! You can get a loyalty card that tracks the purchases habits of that customer at your store and see what they purchase regularly, or perhaps what they returned. Then you can take this data and use it to improve your business offerings or make sure you have enough inventory of your popular items during the busy season. If you’re really serious about this method, consider getting a POS system that integrates with your loyalty program of choice and you will be able to glean a wealth of knowledge about your customer base and use that data to improve your business. By using a POS system you can even create personalized offers to your customers based on their purchase habits. A loyalty program indicates to your customers that you care about them and not just your bottom line. It says, “Thank you for doing business with us. Here’s a little something to show our appreciation.” Plus, a happy customer means they are more likely to tell their friends and family about your business which will in turn generate new customers for you. Whether your small business chooses a punch card, a points system, a rewards card, or something else, any of these can and will help your business’s bottom line if implemented correctly. Do some research on what type of loyalty program would best fit the type of business you own, get the wheels in motion, and start creating those lifelong customers!